It’s pretty rare that a post in this series ends up being a happy, feel-good story and I thought it was time to change that. So cozy up by the fire with a warm cup of cocoa on this Christmas Eve while I tell you a tale about an unhappy traveler who had her day turned around by American. was supposed to come home to Tennessee on a Friday and then have a good birthday weekend ahead. But things went wrong, and her return was pushed into Saturday, cutting into the weekend. With her birthday not until Monday, that still wasn’t bad… until she got home. She was told she had to turn back around for another meeting that very Monday morning. Brutal. So it was that Elaine booked flights to go back to Columbus late on Sunday night, planned to meet with her contacts Monday morning, and then expected to fly back via Charlotte on American. She’d get home in time for a night out. Even if everything went to plan, this was going to be a pretty crappy birthday. And of course, things didn’t go according to plan when it mattered to her most, on her return. First, her flight back to Charlotte was delayed due to a late arriving aircraft. She still had a shot at making her connection, but it was going to be iffy. Then the airplane got to Columbus… and broke. Nearly two hours later, the airplane was fixed and she was on her way. But now she wasn’t going to get home in time for dinner, the last piece of her birthday that she hoped to salvage. Was this an earth-shattering delay that was going to ruin her life? Of course not. There were other flights with seats and she would get home only a couple hours late. But this was just the cherry on top of a tough couple days, and I felt bad. So while she was enroute to Charlotte, I sent a direct message to American on Twitter. I figured if nothing else, Elaine needed a beer, or at least something to celebrate her birthday just a little. So I asked if American had a way to get a message to a crew. Her connecting flight was on a mainline aircraft, and I figured it might be a nice little gesture. It wasn’t long before I received a note back from American saying that they had sent a note to the airport team to see if they could get anything done. Once Elaine was back home, I heard from her. There was no actual beer, but she said after she boarded, the flight attendants came up to her along with a couple gate agents. She thought she had done something wrong, but of course, she hadn’t. They started singing “Happy Birthday” to her. Then once they landed, the flight attendant on the intercom told everyone to make sure to wish Elaine a happy birthday as they got off the airplane. That small gesture absolutely made her day, and she can thank American’s Twitter team for that. I fully expect to see comments like “well that’s nice, but American totally screwed me” or “whatever, they only did it because you write this blog.” While I doubt the latter was true (this really just seemed like one of those great “surprise and delight” opportunities), those comments are lost on me. This was just a great example of a big faceless company doing something small and meaningful to help makes someone’s birthday just a little bit better. Despite the mergers reducing competition, we’re, gasp, seeing airlines invest in their products, and doing other customer friendly this like charging less than stratospheric prices for first class. Those investments are acknowledgements that the market is still competitive, despite the reduced competiton. Any chance these things on the soft product side are recognition of the same? Dan – I think in general that’s probably true. The big airlines realize that price competition isn’t going to result in a profitable company (it hasn’t before). And in general airlines are going to be price competitive with each other. So now they’re taking their profits and investing in the business for customers. I don’t know that you can tie this specific instance to that effort, but it’s part of the broader shift. Everytime I board an aircraft, one of two things happen. Now, I know, all they’ve done is read my boarding pass. But that little extra effort makes all the difference. Well done American. It’s good to remember that “big faceless corporations” are full of faces! Brett – I don’t get it. You seem so pro-American Airlines and so anti-Delta. Delta has not only proven themselves to be far-and-away the best US domestic airline, they’ve also done so many things that have helped the industry as a whole (or will). And yet, whenever you throw Delta a compliment, it’s always reluctantly. 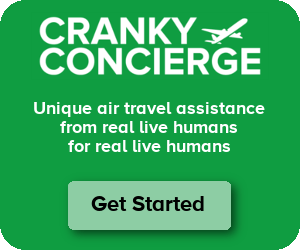 Perhaps a well-run airlines isn’t good for your concierge business? Am I just imagining this? Can you help me understand? Um, Southwest called, they want to have a word with you, re: “best domestic airline”. Hmm actually Alaska is the one who would call :) They are the winners of JD Powers for being the best and from flying a 100K a year on various airlines my experience is they are the most consistent for good customer service. I agree, Alaska is excellent. The FAs and pilots are always friendly and they operate largely on time. I’ve collected exactly once on their luggage within 20 minutes promise, and that’s when it was 3 minutes late, and a staffer OFFERED me the compensation (I would not have bothered to ask). I’m glad American folks went a teeny bit out of their way to be nice to Elaine. The little things DO matter. It’s good to see that airlines try to do the right thing sometimes and go the extra mile. Those kind of things bring loyalty to an airline. Years ago when I was living in CA and was going home for Christmas on a non-stop from ONT to CVG. The day before my scheduled departure I got a frantic call from my wife (who was already back in Cincy). My dad was taken to the hospital with a serious medical emergency. I was flying on an award ticket, but I called the Medallion hotline to see if there was any way to get home early. DL got me on the evening n/s to CVG. Then things started to go bad. They cancelled the CVG flight due to a maintenance issue. The gate agent called me up to the desk and said he had checked other flights and there were a few seats on the LAX to CVG flight that night. He asked me if I wanted to be taxied down to LAX and catch that flight. Needless to say yes I did. He handed me my boarding pass for that flight and said he hoped my father was OK and let them know if I needed to change return flights. I never mentioned anything to him about my father so all I can guess was there was a flag on my reservation and a note on this. Once I got to LAX I checked my boarding pass for the first time. DL upgraded me to first. That level of caring brought DL a lot more of my business to this day. It doesn’t matter what airline, individuals took time out of their normal duties to do a personal act of kindness. When I was with American , I would have done too. I always went above the norm in customer service. I just recently made Gold on American. Getting upgrades will be tough but I had to fly to a meeting on a Sunday which happened to be my birthday. Surprise! I got a first class upgrade on a good plane (I think it was a 757?). I’m not sure if was because the gate agent could see it was my birthday, but in any case, I was just thrilled. ? Great story, Cranky. Thanks for sharing. I always thought since airlines already have access to birthday information they could wish passengers a happy birthday more often when they’re flying. Simple gestures really go a long way in a customer’s mind to providing food service. Kudos to Southwest for sending me an email to mark the day. It’s really nice to see American stepping in this case and the Twitter team for making it happen. I guess I need to have a Twitter account. That seems the best way to get the airline’s attention these days. They don’t want to see negative tweets. Cranky: I wonder if anyone ever tweeted them a positive experience? Have you seen this besides this occasion? SteveFromCVG – Oh sure, people tweet positive stuff all the time. It doesn’t matter if it’s AA, UA, DL, or WN. People can make the difference if they want to. I’ve had pleasant experiences with all of the airlines, and an occasional “we should do better moment” with all of them too. Best wishes for 2016. Glad to hear that there are some nice people in the airline industry. Thanks for a nice story. People tend to focus on the few mistakes airlines (and other businesses and individuals) make; and take for granted the thousands trips (and other every day occurrences) that are done well by many caring individuals. I wish all safe travels. Brett- You nailed it on the head for the expected comments. I can say the @DeltaAssist team did the same for my sister when she flew on her birthday. I think its just luck of the draw for someone deciding to go out of their way for something like this.